.....the deliciousness of tapioca. I remember as a child, tapioca pudding could be enjoyed at most restaurants, school cafeteria's and at home. We never blinked an eye when we were served this "soft-lumped" sweet, vanilla-tinged pudding. But that was the extent of the flavor...vanilla! I don't even remember anything but a firm glob of whipped cream sitting on top, only to be folded in before we lifted a spoonful into our mouths. I do believe, however, that it is a sign of the times that we rarely see this pudding served anywhere and anymore. Not because our palates have changed, per se, but because parents do not cook at home nearly as much as they did many years ago. Don't you agree? It was a treat to have home baked cookies, pies, cakes and puddings because not only did our parents take the time to cook for us, but the array of sweet treats found at any store was miniscule compared to today's inventory. With the vast array of candies, pastries and sweets found on counters, next to the cash registers, now, our taste transcends just simple and sweet. We have choices of flavors that we didn't have a generation ago, but those flavors are manufactured. And because of our "fake food" indulgences of today. our bodies are slowly begging for change. Accepting the man-made treats with ingredients that are manufactured in a lab, is universally accepted by our bodies, forgoing anything natural and homemade. Let's take a few minutes and prepare this classic dessert, but with something that compliments this dish, and ingredients our body desires.....fruit and flavor! 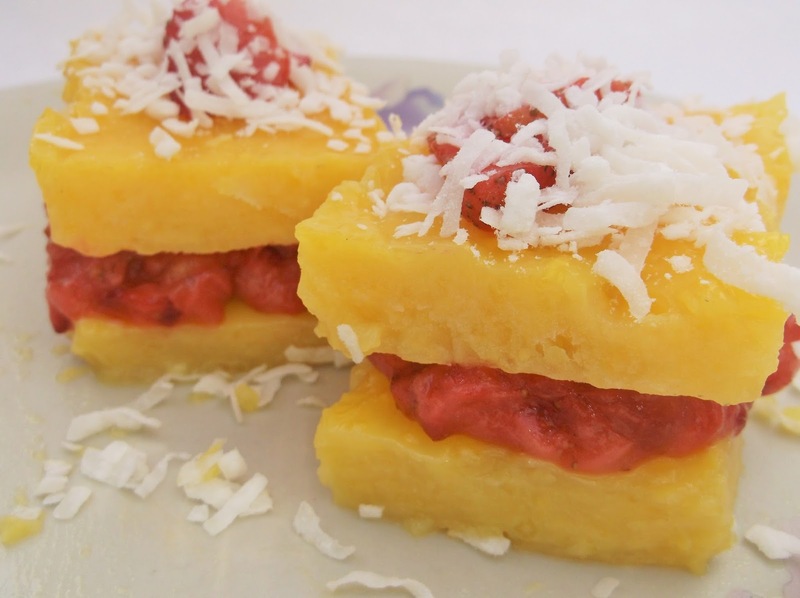 Such a gorgeous presentation, only "one-upped" by the flavor of lemon, coconut and strawberries, all mingling on your tongue as brightly as the visual impact of this Brazilian-inspired dessert. The coconut water is widely available in most supermarkets and if desired, add a couple drops yellow food coloring to the pudding before refrigerating. Lightly grease a 9 x 12-inch pan(or equivalent) with nonstick cooking spray; set aside. In a large bowl, combine coconut, tapioca and sugar; set aside. Bring milk, 1 cup coconut water, lemon rind and juice to scalding over medium heat, stirring frequently. When just starting to come to a boil, immediately remove from heat and pour over coconut mixture. Blend in the curd completely and pour into prepared pan. Cover(without film wrap touching the pudding)and refrigerate until completely cold and firm. Meanwhile, hull strawberries, slicing and setting aside 3 of them. Roughly chop remainder and add to a small saucepan with cornstarch. Toss to coat evenly and add remainder of coconut water. Mash with a sturdy fork while bringing to boiling over medium high heat. Once boiling, remove from heat and transfer to a bowl. Cover and refrigerate until needed. To assemble, cut firm pudding into 12 equal-sized squares. 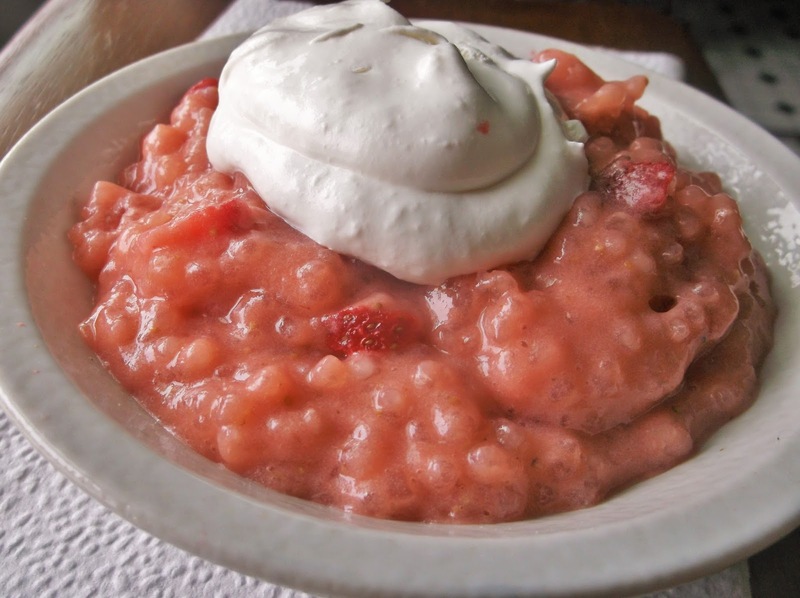 Place 1 square on a serving dish, add a couple tablespoons macerated strawberries and top with another square of pudding. Repeat and serve cold, dusted with additional coconut. Tapioca is quite confusing. It is marketed in several forms, with each company portraying their product in different manners. To put all this in a nutshell, minute, quick cooking and instant are all the same. 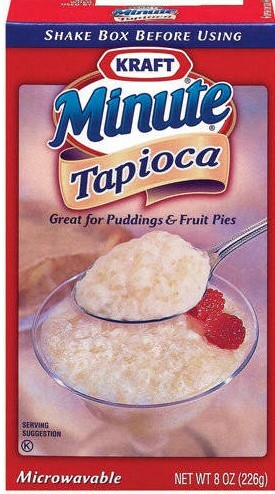 This is the type of tapioca I use in this "best of the best" strawberry pudding. There is also pearl tapioca, coming in small and large pearls. These can be substituted in this recipe as well by simply doubling the amount of tapioca and adding 1 additional egg. Cook as directed below, and you will have a treat even the hesitant children will love. Place the milk in a container that is marked with volume measurements, such as a large measuring cup or blender container. Slice strawberries into the milk to bring it up to 3 cups total volume. Puree until as smooth as possible. Transfer to a medium saucepan with remainder of ingredients, except vanilla. Bring to scalding over medium heat, stirring almost constantly as it heats up. When thickened and hot. remove from heat, stir in vanilla and pour into large bowl. Cover and refrigerate at least 2 hours, or until completely cold. When ready to serve, remove from refrigerator and stir in as many chopped, fresh strawberries as desired. Spoon into serving bowls and add whipped topping if desired.